"The professors have this work hard/play hard attitude, which sounds cliche, but not a lot of other statistics departments prioritize balance the way our professors do. And that’s what sold me on coming here." A $500,000 gift to UC Santa Cruz from computer security company Symantec, plus matching funds from the UC Presidential Match for Endowed Chairs, will establish a $1 million endowment at UC Santa Cruz for the Symantec Presidential Chair in Storage and Security at UCSC's Baskin School of Engineering. The endowed chair supports research and teaching in the engineering school's Department of Computer Science, which has strong programs in computer security and data storage systems. 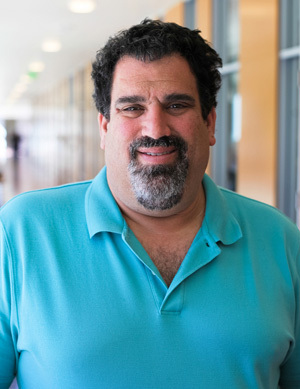 Ethan Miller, professor of computer science and director of the Center for Research in Storage Systems at UC Santa Cruz, has been appointed as the inaugural holder of the new chair. Joe Konopelski, dean of the Baskin School of Engineering, said Symantec is the first corporation to fund an endowed chair at UC Santa Cruz, and this is the first endowed chair in the UC system to take advantage of the new matching fund program announced in July by UC President Janet Napolitano. "We are very grateful to Symantec for their support and recognition of our outstanding computer science faculty and programs," Konopelski said. "The Symantec Presidential Chair in Storage and Security will help strengthen and grow our research and education programs in the crucial areas of computer security and data storage." "UCSC's Baskin School of Engineering is leading academic research spanning both the storage and security industries," said Darren Shou, a senior director of Symantec Research Labs. "Establishing the Symantec Presidential Chair in Storage and Security enables Symantec to further our cutting-edge research efforts and identify new methods for addressing customers' problems in today's complex technology landscape." The Baskin School of Engineering is home to world-class faculty in data storage systems and other key areas of data science. Symantec's gift is a significant contribution to the Data Science Leadership Initiative of the $300-million Campaign for UC Santa Cruz. Miller's research addresses the growing challenges of storing and managing massive amounts of electronic data. He noted that Symantec has hired a number of graduate students from UCSC's storage systems research program over the years, as well as several undergraduate alumni. "I think their gift in support of our programs shows high regard for our research and the quality of our students. I am honored to be the first to hold the Symantec Presidential Chair in Storage and Security," Miller said. The funds from the endowed chair will be helpful in many ways, he noted, from recruiting graduate students to pursuing preliminary research projects that could lead to major grant funding. "If I can fund a graduate student to go to a conference or to work for a quarter on an idea that might lead to a major grant proposal, that's a big win," Miller said. "I'll also be able to give more talks at other universities, which increases the department's and school's visibility and helps us attract students who might not otherwise know that UC Santa Cruz is a great place to do computer science research." The campus's location near Silicon Valley is an advantage in developing effective collaborations with industry, he added. Miller and other faculty in the Baskin School of Engineering have longstanding relationships with industry partners in Silicon Valley. The Campaign for UC Santa Cruz supports excellence across the university through increased private investment in the people and ideas shaping the future. It is bringing critical new resources to each academic division, and to signature initiatives in the Student Experience, Genomics and Health, Coastal Sustainability, the Institute of the Arts and Sciences, and Data Science Leadership.